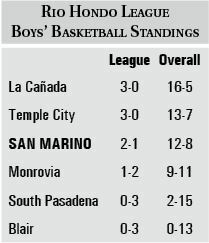 The San Marino High School varsity boys’ basketball team’s four-game winning streak came to an end last Friday following a tough 59-58 loss to visiting Temple City. The matchup was close from the start as the Rams led by only one after one quarter of play. The Titans played stingy defense in the second quarter to go into the half with a 26-22 lead. 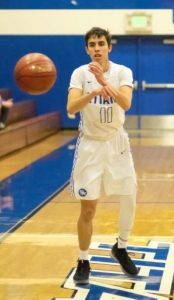 San Marino’s offense continued to produce in the third quarter, building a seven-point advantage going into the final eight minutes of play. Temple City, however, began to rally in the final quarter. Two big 3-pointers in the waning moments of the contest propelled the visitors to victory. “Friday’s game was an important game for us on so many levels,” SMHS head coach Mihail Papadopulos wrote in an email. Not only is Temple City a league foe, they are a division team and a good measuring stick for our young boys. We knew that these games were going to be intense and fiercely contested at times, and, unfortunately, I thought we lost our composure tonight, especially at some key moments. Ethan Deng led San Marino with 15 points and Sean O’Brien chipped in 14 points, three rebounds, four assists and two blocks. Lemuel Li added eight points and four rebounds, Cristian Mata finished with seven points and four rebounds, Ethan Mo scored five points, Eric Fu finished with three points and four rebounds, Michael Baldocchi had two points and five rebounds, and Chris Wicke contributed two points and four rebounds. 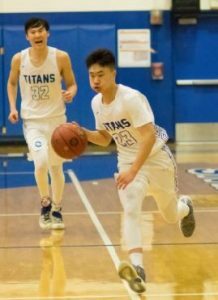 The Titans (12-8 overall record, 2-1 in league) will travel to Pasadena to take on Blair in a league game this Friday, Jan. 18, at 5:15 p.m.
Ethan Deng scored a game-high 19 points and led the Titans to a 62-55 victory over visiting Monrovia last week. The Wildcats pressured San Marino throughout the game, but the home squad managed to find holes in the opposing defense to keep up. The Titans managed to pull away in the second quarter and add more cushion to its lead. Lemuel Li scored nine points and grabbed seven rebounds and Cristian Mata added seven points, nine rebounds, one steal and one block. Michael Baldocchi finished with seven points, five rebounds and two blocks, Eric Fu had seven points and six rebounds, Ethan Mo netted seven points and blocked two shots, Sean O’Brien had six points, five assists, two rebounds and two blocks, and Chris Wicke contributed five rebounds.